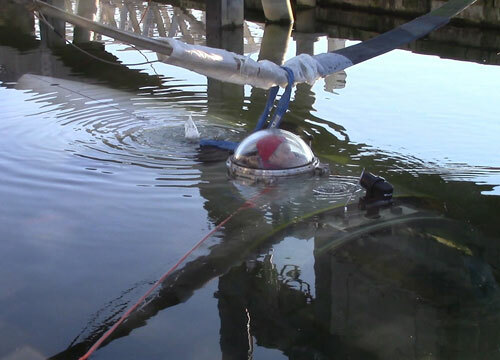 Over years of planning, many months of dedicated assembly, fabrication, design review, and integration of critical systems components finally culminated in the successful launch and initial sea trials of OceanGate’s latest manned submersible, Cyclops 1 at the end of 2014. Through a public/private collaboration between the University of Washington’s Applied Physics Lab and OceanGate, Inc. the debut of the most progressive and advanced manned submersible is now reality. 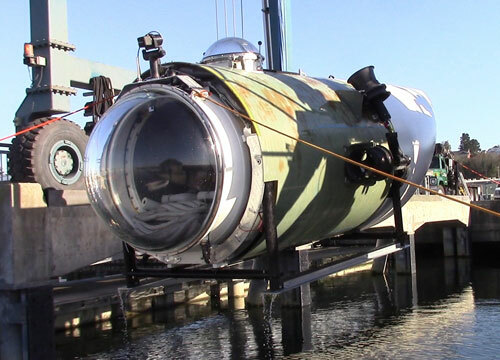 The early morning launch in the sunny, but brisk cold morning air occurred without incident as the sub was carefully lowered into the chilly waters off the Port of Everett marina’s main dock. Steam rising from the surface created a mystery layer of foggy marine air that hung quietly over the test site. A full contingent of personnel from both UW/APL and OceanGate were on hand to witness this historic moment. Cameras poised at the ready, radio’s crackling with the sounds voices orchestrating instructions to crane operators and yard personnel. The crew lowers Cyclops 1 with the TraveLift at the Port of Everett. “Steady as she goes” were the words from the mission director. Everyone remained anxious and excited about the newly designed submersible, the first of her kind, as she slowly submerged under the glassy calm water. While hanging from the Travel Lift crane, the sub was subjected to a series of initial water intrusion and leak tests before being completely lowered and allowed to sit, positively buoyant, on the surface while OceanGate personnel monitored her progress and noted changes to any external equipment. Cyclops 1 submerges for the first time. After further evaluation a select team of engineers from both parties entered the sub and began an extensive checklist of pre-dive exercises, equipment and systems tests. Topside personnel remained vigilant as the well-planned schedule and mission operations objectives were systematically reviewed, conducted and then completed. With the passing of each test and sign-off the sub became more and more “alive”. Finally, with a thumbs up, the thruster motors and power management system were set on full operations mode, activating four heavy duty motor drives that went into state of furry as they stirred and agitated the icy waters in vicious show of force. The power and thrust capacity were clearly evident as the conical shape of the sub lurched to and fro in her harness; a thoroughbred stallion of a race horse galloping on her reins in the stable. We could tell that this sub wanted to run! All in good time we were told. All in good time. The day proved exceptional productive as the sub passed all her major tests without significant issue. From there we would begin the process of towing her out to selected locations in the nearby harbor for more extensive shallow water dives. But not before the team and staff from OceanGate and UW/APL had a chance for extensive debrief and systems analysis. The road to deep water work is paved with careful, thoughtful and meaningful purpose and planning. Cutting corners has to be avoided to minimize unnecessary risk and potential damage to the sub or injury to personnel. With this operating discipline instilled across all personnel, the submersible would prove, time and time again, to be an impressive and nimble vehicle.